I made this owl pincushion for my Gram who is turning 93 tomorrow! She sews adorable dresses, nightgowns and bathrobes for 18 inch dolls (like the American Girl dolls), so I thought it'd be fun to make her a new pincushion! I traced my owl drawing onto fabric with a disappearing ink marker and stitched my design with a couple of different stitches (stem stitch, chain stitch, back stitch, satin stitch, and seed stitch). I used a sewing machine to sew my embroidery and my green patterned fabric right sides together, leaving a little hole for turning the owl right side out. 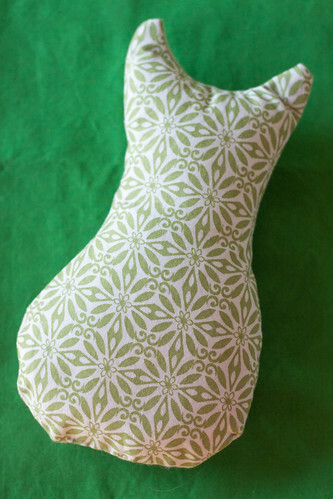 I'm usually a disaster with a sewing machine and would like to happily add that I only had to use a seam ripper twice! (My first attempt I did a perfect sewing job only to realize I had my backing fabric wrong side out!) 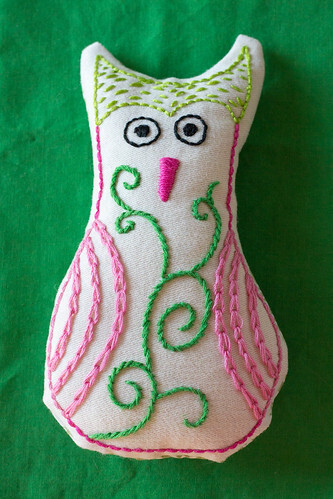 I then turned the owl right side out, stuffed it, and hand sewed up my turning hole! We had my Gram's birthday party over the weekend, so later this week I'll share a few pictures of the table we had set up for it! This is both beautiful and sweet!!!! ... and you do embroidery too! 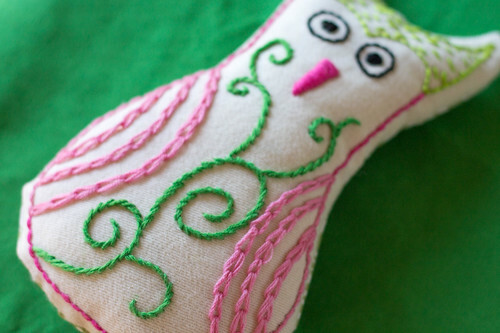 I love the stem stitch and running stitch, but could never manage satin stitch which you have made a beautiful job on the owl's beak! You're Gram must have been thrilled with such a thoughtful gift that she can use for her dressmaking skills! Many good wishes to your dear Gram!! Lovely, neat stitching Kate! What a lovely gift!